Click here to go back to La'asok B'divrei Torah . Click here to go forward to Yishtabach. I will extol You, my God and sovereign, and bless Your nam forever and ever. Great is Adonai and much acclaimed; God's greatness cannot be fathomed. One generation shall laud Your works to another and declare Your might acts. The glorious majesty of Your splendor and Your wondrous acts I will recite. They shall talk of the might of Your awesome deeds, and I will recount Your greatness. Adonai is gracious and compassionate, slow to anger and abounding in kindness. Adonai is good to all, and God's mercy is upon all God's works. All Your works shall praise You, Adonai, and Your faithful ones shall bless You. to make God's mighty acts known among mortals and the majestic glory of Your sovereignty. Your sovereignty is eternal; Your dominion is for all generations. Adonai supports all who stumble, and makes all who are bent stand straight. You give it openhandedly, feeding every creature to its heart's content. Adonai is beneficent in all ways and faithful in all works. Adonai is near to all who call, to all who call upon God with sincerity. Adonai fulfills the wishes of those who fear God; Adonai hears their cry and delivers them. Adonai watches over all who love God, but all the wicked God will destroy. My mouth shall utter the praise of Adonai, and all creatures shall bless God's holy name forever and ever. ​We will bless God now and always. Hallelujah! Ashrei is made up mostly of Psalm 145. It includes verses from other psalms at the beginning and the end. The words of Ashrei mostly praise God for making our lives joyful when we are close to God, for ruling the world with justice, and for providing for all our needs. 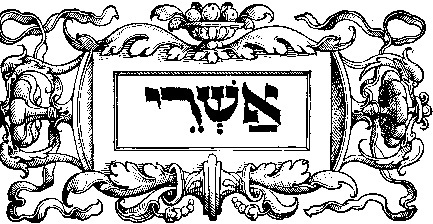 Because the prayer is composed as an acrostic – with lines beginning with the letters of the Hebrew alphabet in order – it is easy for Hebrew speakers to memorize. (One letter is missing – there is no verse for the letter Nun.) The prayer may have been favored by the early rabbis because it was a joyful and popular way of singing God's praises. There is a familiar call-and-response melody for chanting Ashrei that emphasizes joy and rhythm. Reciting Ashrei can be a meditative experience. The specific words of the prayer are not as important as the pleasure of joining with other voices in familiar song.